Purpose: To demonstrate God's sovereignty and the meaning of true faith. It addresses the question, "Why do the righteous suffer?" Author: Unknown, possibly Job. Some have suggested Moses, Solomon ,or Elihu. Date written: Unknown. Records events that probably occurred during the time of the patriarchs, approximately 2000-1800 B.C. Special features: job is the first of the poetic books in the Hebrew Bible. Some believe this was the first book of the Bible to be written. The book gives us insights into the work of Satan. Ezekiel 14:14, 20 and James 5:11 mention Job as a historical character. Prayed about his and Sarah’s lack of a child, grieving that he had no heir (Gen. 15:1–6). Prayed for help in finding a wife for Isaac (Gen. 24:12–14). Prayed about Rebekah’s barrenness (Gen. 25:21). Prayed in preparation for meeting his estranged brother Esau, whom he had not seen in many years (Gen. 32:9–12). Prayed for God’s mercy on his brother Aaron after the incident with the golden calf (Deut. 9:20). Prayed for a son and promised to give him back to God if He would end her barrenness (1 Sam. 1:9–20). Prayed that God would spare the life of his infant son born to Bathsheba (2 Sam. 12:15–16). Prayed for his son Solomon, that God would grant him a faithful heart to lead Israel and build the temple (1 Chr. 29:16–19). Word in life study Bible . 1997, c1996 (electronic ed.) (Job 10.18). Nashville: Thomas Nelson. IF Job is blessed by God, THEN he will be faithful. IF Job is faithful, THEN he will be blessed. IF Job is not blessed by God, THEN he will be unfaithful. IF Job is unfaithful, THEN he will be punished. New Geneva study Bible. 1997, c1995 (electronic ed.) (Job 1.1). Nashville: Thomas Nelson. New Geneva study Bible. 1997, c1995 (electronic ed.) (Job 1.4). Nashville: Thomas Nelson. New Geneva study Bible. 1997, c1995 (electronic ed.) (Job 41.1). Nashville: Thomas Nelson. When suffering or troubles happen, do they always come from Satan? In Job's story, his series of tragedies did come from Satan, but this is not always the case. The chart above demonstrates the four main causes of suffering. Any one of these or a combination of them may create suffering. If knowing why we are suffering will teach us to avoid the cause, then the causes are worth knowing. However, it is most important to know howto respond during suffering. Others' sin Person who sinned and others who allowed the sin Probably many people, including those who sinned Active resistance to the sinful behavior, while accepting the sinner. Zophar the Naamanthite Job 11; 20 seven days. No response God does not directly address Elihu. 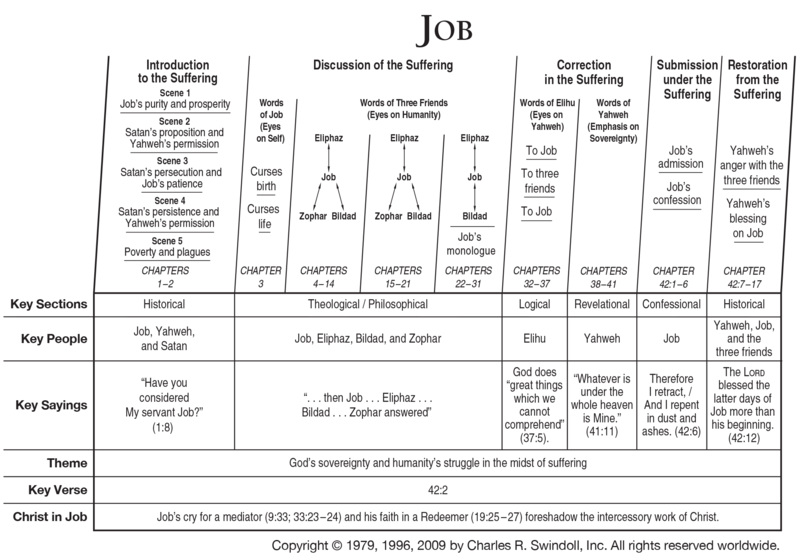 God Job 38-41 Confronted Job with the need to be content even though he didn't know why he was suffering Di not explain the reason for the pain. Do you still want to argue with the Almighty? Job a wealthy and upright man, lost his possessions, his children, and his health. Job did not understand why he was suffering. Why does God allow his children to suffer? Although there is an explanation, we may not know it white we are here on earth. In the meantime, we must always be ready for testing in our lives. Job's friends wrongly assumed that suffering always came as a result of sin. With this in mind, they tried to persuade Job to repent of his sin. But the three friends were wrong. Suffering is not always a direct result of personal sin. When we experience severe suffering, it may not be our fault, so we don't have to add to our pain by feeling guilty that some hidden sin is causing our trouble. A young man named Elihu, who had been listening to the entire conversation, criticized the three friends for being unable to answer Job. He said that although Job was a good man, he had allowed himself to become proud, and God was punishing him om order to humble him. This answer was partially true because suffering does purify our faith. But God is beyond our comprehension, and we cannot know why he allows each instance of suffering to come into our lives. Our part is simply to remain faithful. God himself finally answered Job. God is in control of the world, and only he understands why the good are allowed to suffer. This only becomes clear to us when we see God for who he is. We must courageously accept what God allows to happen in our lives and remain firmly committed to him. Job finally learned that when nothing else was left, he had God, and that was enough. Through suffering, we learn that God is enough for our lives and our future. We must love God regardless of whether he allows blessing or suffering to come to us. Testing is difficult, but the result is often a deeper relationship with God. Those who endure the testing of their faith will experience God's great rewards in the end.